We are about to embark on a new adventure and become a homeschooling family. Wow that sounds weird saying that out loud. If you had told me even just a few years ago that I would be a homeschooling mom I would have laughed in your face. I always said I would never home school my kids. Not because I think it's a bad thing but I just didn't feel I possessed the skills or desire to take that on. So how did I end up taking on the responsibility of homeschooling my kids? It all started a few years ago when God began to whisper to me about the idea of homeschooling. I say whisper because that's exactly what He did. He knew if he was too pushy about it I would run the other way and not look back. At first I ignored his nudging but, as He always does, those whispers didn't quit, they just grew stronger and a bit louder. 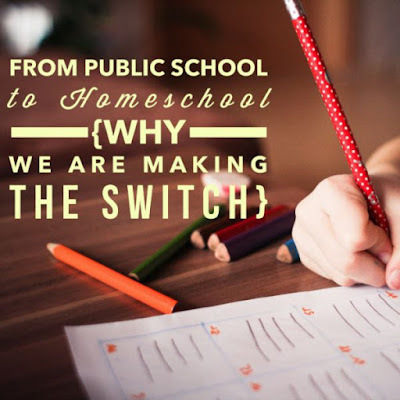 One day I was honest with God about my hesitations to homeschool and told him that if He is calling me to it He would need to make it really clear and change my heart about it. In true God fashion, that exact same day I had a lady(who I do not know) tell me she felt she was supposed to give me 2 HUGE boxes of school curriculum. Wouldn't you know it was for the exact same age my girls will be next year. Anyone who homeschools knows how expensive curriculum can be so that was a huge blessing. I still pulled a Gideon on God and said that wasn't enough. Then He started changing my heart about it. I started getting excited about the thought of planning school days, field trips and searching on Pinterest for fun activities to do with the kids. This heart change was a bigger miracle for me because I knew I couldn't have made that switch on my own. Am I scared, anxious and nervous? Yes. Am I sad to leave our school friends? Yes. But just like anything that God calls me to I am hanging on to the fact that God said go. There is nothing worse than having God tell you to move into a new season and us being too stubborn or fearful to do it. Every one's life is miserable around you when you aren't where you are supposed to be. One prayer/request I have for all the mommies out there is stop the judging and comparison game. God has every family on a completely different path and I believe it's time we begin supporting one another rather than criticizing and talking bad about the others decisions. I have been in the public school system and am now entering into the homeschooling arena and have seen both sides of the coin. I see pros and cons to both. We were blessed to have amazing teachers for our girls(and that is what makes this decision a difficult one). But one recurring theme I see on both sides is the judgment of the other side. Homeschooling moms: be kind to the public school families. They are doing what they feel is best for their family and are able to do at the time. Public school moms & teachers: be kind to the homeschooling families. They don't have all the training as you(though some do) but they feel God calling them to have their kids at home with them for this season and He will provide all they need for that season. So why am I homeshooling? Because I need to shelter my kids or I think public schools are the devil? No. The only reason I am homeschooling is because God called me to. How long will we homeschool? I don't know. I am following God one day at a time on this journey and am seeking him daily about where my kids need to be. Who knows, maybe next year we will be back in public school or on to a private school! We move when He tells us to so for now this is where we are planted. I would love prayers and support as we move into this new and exciting "outside of the shell" season! Praying for you and us, we were called to do the same and scared and elated are both emotions I know well. :-) Excited to get to know your family more! Thanks Robyn! I'm excited for our families to get to do this together!